Scouting nanoparticles (blue) find tumor cells, then broadcast their location. Responding nanoparticles (red) swarm to the location carrying payloads of drugs, concentrating treatment where it is needed. Like swarming insects drawing crowds to a food source, a system of nanoparticles and engineered proteins can communicate with one another to raise the concentration of systemically administered drugs at the site of a tumor, a team of scientists from the University of California, San Diego, MIT, and the Sanford-Burnham Medical Research Institute has demonstrated. The system harnesses one of the body’s own communication pathways, one that coagulates blood, to accumulate drugs right where they are needed. “We engineered a set of nanoparticles that trigger the body to grow blood clots around tumors. A second set of nanoparticles that recognizes the blood clots then delivers a dose of anti-cancer drug to the tumor,” said Michael Sailor, professor of chemistry and biochemistry at UC San Diego. Sailor and colleagues at MIT and UC Santa Barbara’s Sanford-Burnham Medical Research Institute describe their system in Nature Materials online July 19 ahead of the print edition of the journal. Nanoparticle scouts find the tumor, then broadcast its location by triggering the natural biochemical cascade. Responding nanoparticles, loaded with drugs or possibly markers that would help a surgeon identify the outlines of a tumor, recognize the signal and swarm toward the tumor. “The main purpose of using the combination of two different nanoparticles is to reduce the total amount of drug that must be administered to a patient while improving the ability of the drug to cure the disease. 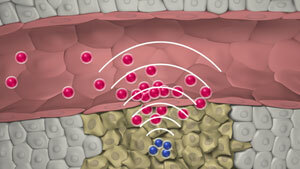 The signaling nanoparticles amplify the ability of the drug-carrying nanoparticles to home to the tumor,” Sailor said. In one of the several similar systems the team developed, the communicating nanoparticles delivered 40 times the amount of drug to a tumor site, compared to nearly identical nanoparticles with no signaling capacity. Better targeting should boost the effectiveness of a drug while minimizing side effects. “The cells in your body have many ways to communicate with each other. This work shows that artificial systems can be engineered to set up similar communication links in the body,” Sailor said. This work is part of an ongoing collaboration between Michael Sailor’s research group at UC San Diego’s Division of Physical Sciences, Sangeeta Bhatia’s group at MIT’s Division of Health Sciences and Technology, and Erkki Ruoslahti’s team at the Sanford-Burnham Medical Research Institute, UC Santa Barbara. Ji-Ho Park, a graduate student in UC San Diego’s Materials Science and Engineering program, was a key member of the team. The National Cancer Institute supported this work.